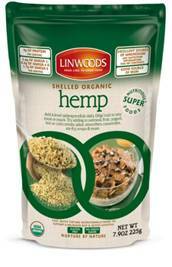 Maintaining a balanced high-nutrition diet can be challenging, but Linwood’s Superfoods makes filling nutritional gaps easy with their delicious Shelled Organic Hemp. A high source of protein, an ideal food for a vegan diet, low 3:1 ratio of Omega-6 to Omega-3 fatty acids, and a large variety of other vitamins and minerals make hemp seeds the perfect vehicle for sustainable energy, accelerated brain power, and overall health*. In fact, Oprah Winfrey named Hemp Seeds as one of the 4 healthiest seeds in her September 2011 issue. We would really like more products like this being adopted by people the hemp industry deserves more attention. It is one of the best plants we have. Linwoods Shelled Organic Hemp Seeds contain no added sugar, is dairy free, yeast free, GMO free and is certified organic by Soil Association Certification Ltd. The delicious nutty flavor of hemp seeds enhances any meal. For breakfast try adding it to oatmeal, hot or cold cereals, granola, muffins, yogurt, fruit, fruit or vegetable smoothies, eggs, pancakes & waffles. For a delicious and nutritious lunch add to: salads, salad dressings, cottage cheese, soup, sandwiches, and wraps. For a nutritious and tasty boost to your evening meal, add to: pasta, pizza, rice dishes, casseroles, stuffings, stir-fry, sauces, cous cous, and baked potatoes. Serve this fabulous Greek Salad with your family’s next meal. Based in Northern Ireland and established in 1965, Linwoods is a family owned company that manufactures a range of Premium Bakery, Fresh Dairy and Healthy Super Foods. Linwoods products are sourced in their raw form from around the world and are selected from the best suppliers and growers to ensure the highest quality and standards. All ingredients are natural, organic and turn any meal at any time of the day in to a nutritious, healthy meal bursting with essential fatty acids, protein, iron, calcium, magnesium and essential vitamins and minerals. Linwoods Super Foods products are found in supermarkets and specialty food stores on the West Coast such as Gelsons and Whole foods. You can also purchase their products online at linwoodshealthfoods.com. *Disclosure: I received a package of Linwoods Shelled Organic Hemp Seeds in exchange for this review. All opinions are accurate and 100% mine.